I was always building things from scratch from a very, very early age. I used to take wrapping paper tubes and turn them into rockets. You name it, I did it. Even in elementary school, given the choice between completing a book report and making a diorama, I would make a diorama. I’d recreate a scene from a book (how Roman roads were built, for example) and present this to my teacher. In 7th grade, I remember building a model of Anne Frank’s house. When I started out in high school, there was a small corner of the basement in my house dedicated to some of the tools I had been collecting from my job at a hardware store. By the end of high school, the entire basement was my workshop, filled to the gills with machines and tools. How did your interest transform into a successful business? When I was 21, my mom wanted a dollhouse for her grandchildren. So I made it! Begrudgingly I built it. In fact, I kept adding more and more details to slow the process down. I even glued on individual floors and added intricate details to every feature of the house. When it was finally completed, my mother wanted to keep it for herself! Not too long after that, I attended a miniature show in Florida. I just happened upon the show by chance and walked in because I was bored. When I was inside, my first thought was “wow, I can do that.” So a few weeks later, in 1977, I made my first miniature and never looked back. What was the first miniature you created? 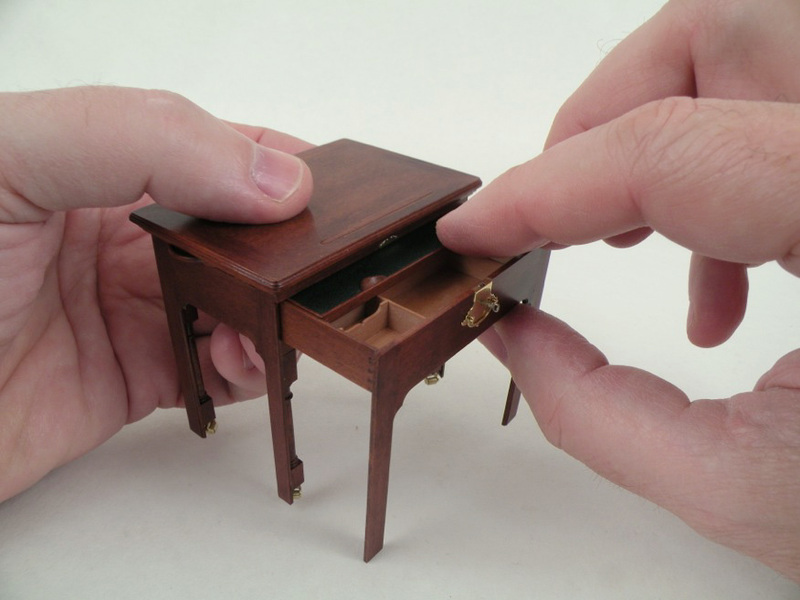 Where does your interest in miniature furniture stem from? I had a magazine with a ladies writing desk on the cover and thought that it would be neat to recreate it. So I scaled it down and made that desk. Shortly after that, I made a better version of the desk – it was magnitudes better the second time around. A gallery in New York saw my work and began selling my miniatures. I sold three miniature desks in one week, and within 6 months, I was selling to the most important American collectors. It’s been 38 years now that I’ve been creating miniatures, and I have spent a great deal of time studying furniture: its history and the craftsmanship behind renowned pieces. At first, I knew nothing about furniture and the history of pieces I was replicating in 1:12 scale. I was just a 20-something-year-old kid. One time, I went into Weschler’s Auction House in Washington D.C. to look at some of the pieces on display. There was a table there by John Goddard, and I grabbed it and flipped it over to examine the bottom. You should have seen the horror on people’s faces. I had no idea! That table was going for $95,000 back in 1977 and a similar table later sold at Christie’s for about $5 million. After that, I learned about furniture very quickly. I copied pieces of furniture and soon discovered that collectors wanted replicas of works by master cabinet makers, not your average table or chair that you’d find at a department store. If you’re going to copy something, you copy it from the very best. So, if you want to copy furniture, you head to the Metropolitan Museum of Art, not to Sears. Fast-forwarding a bunch of years and through extensive studies into furniture making, I learned a tremendous amount about American furniture and French furniture design. I consulted with the best in the field and have been fortunate enough to visit major museums where a work can be taken off display so I’m able to examine it. 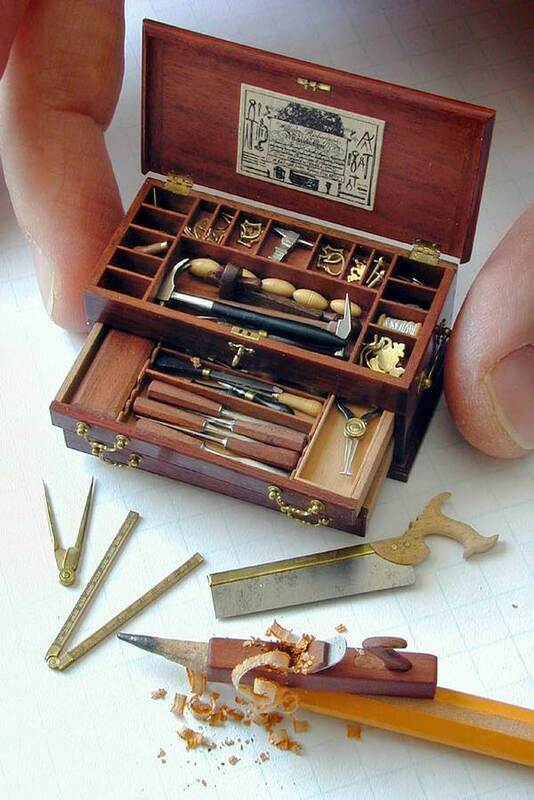 When did you transition from making miniature furniture into making miniature tools? I’ve always been a tool head, and a tool collector. When I was working in the hardware store as a teenager, I’d make about $62 a week, and would bring home half my check in tools. By the time I was done working there, I had pretty much bought one of everything. 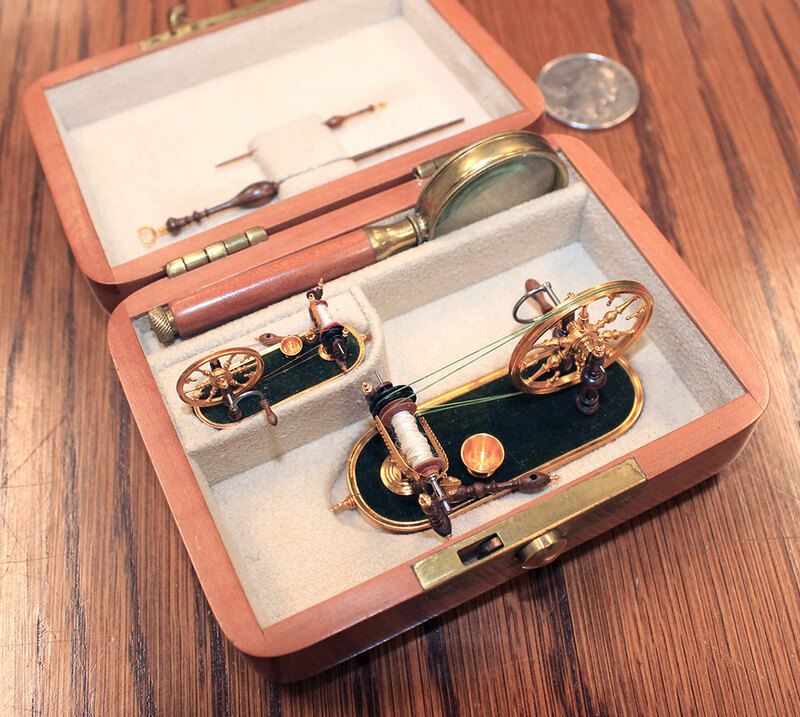 I once visited an antique flea market and came across little watchmaker’s tools accompanied by a tool catalog. The book had hundreds of pages of really neat looking miniature tools, and I had no idea what they were, but I wanted them. 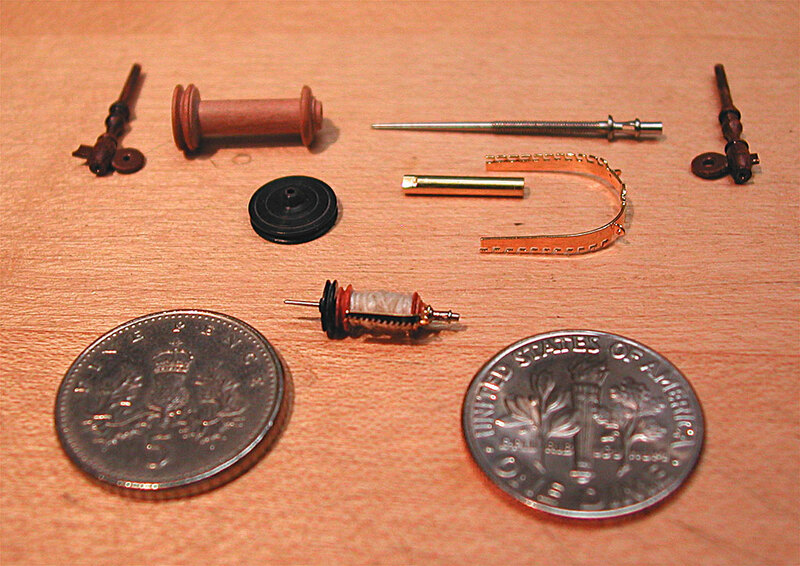 Over the years, I continued collecting tools, big and small, and finally began making tools in miniature. Whenever a friend of mind had a rare tool that they weren’t willing to sell, I would recreate their tool in miniature and show them the replica. They’d say they have to have it, but I’d say, “It’s not for sale, but I’ll trade you for it.” Sure enough, I made quite a few trades to add to my ever-growing tool collection. 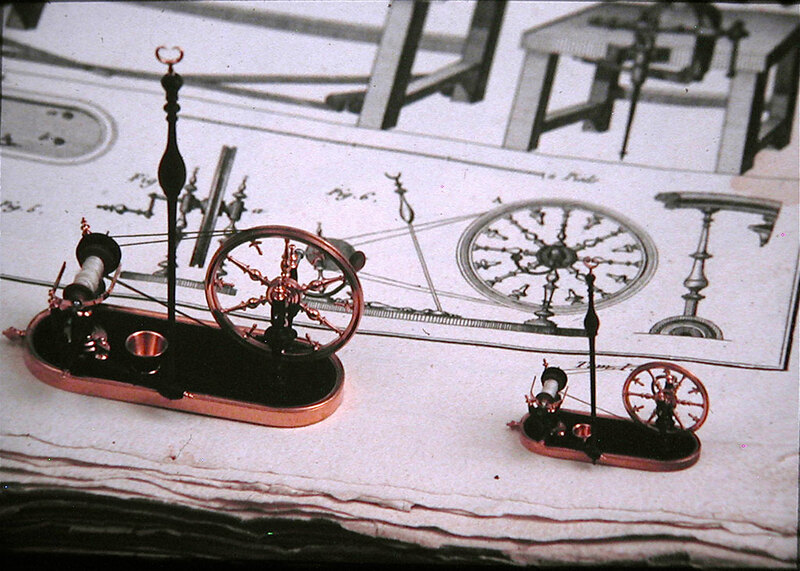 And in due time, when miniature collectors saw the miniature tools I had made, they wanted to add these to their collection. 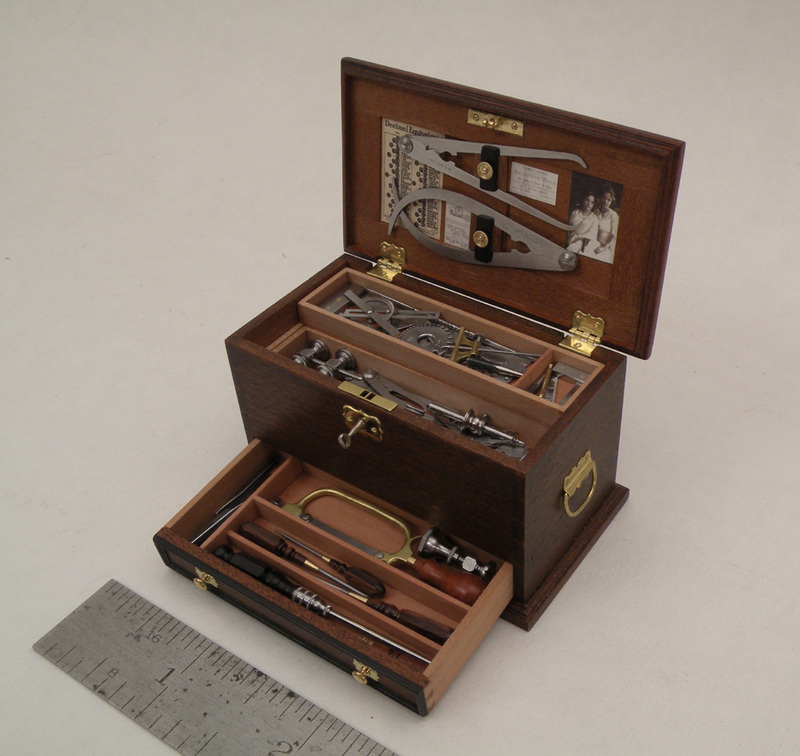 One of my best recognized works is a Hewitt tool chest reproduction based on an original in Colonial Williamsburg. The chest and tools took me roughly 1,000 hours to complete. I use a range of wood depending on the particular work. I frequently use mopane wood to recreate the appearance of mahogany. Mopane looks like mahogany, oxidizes like it and even ages like it. If it looks like the right material to recreate a piece of furniture, I’ll use it. And I have some of everything. Every time I’ve come across materials that are especially unique or interesting, I’ve bought them. I have red brass, yellow brass, green brass, brass rods, brass squares, brass rectangles… you name it. I have nickel silver, German silver, silver with a hint of lead in it… and more! I’ve collected exotic woods, ivory, tortoise shell, shark skin, baleen, whale bone, petrified mammoth tusk… and the list goes on. Non-miniature artists that inspire you? I have closely followed the period of art history dating back to the 17th and 18th centuries, particularly the royal courts in Europe where ivory turning was popular. Even princesses and queens turned ivory on a lathe at that time. The work itself didn’t serve a purpose, much like my craft. I’ve studied this obscure art form for about 30 years and like to think that if I lived during that time period, I would be a court ivory turner. 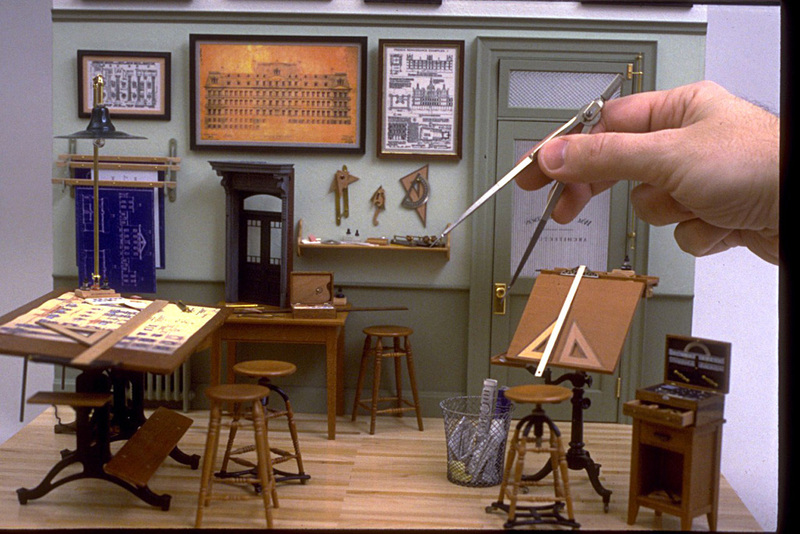 Fellow miniaturists that inspire you? I visited Paul Runyon back in 1978 and learned the basis of my craft in that one day with him. He was the finest American furniture miniaturist. He did a lot with machines, and taught me something extremely valuable: “Don’t waste time looking for something you need. 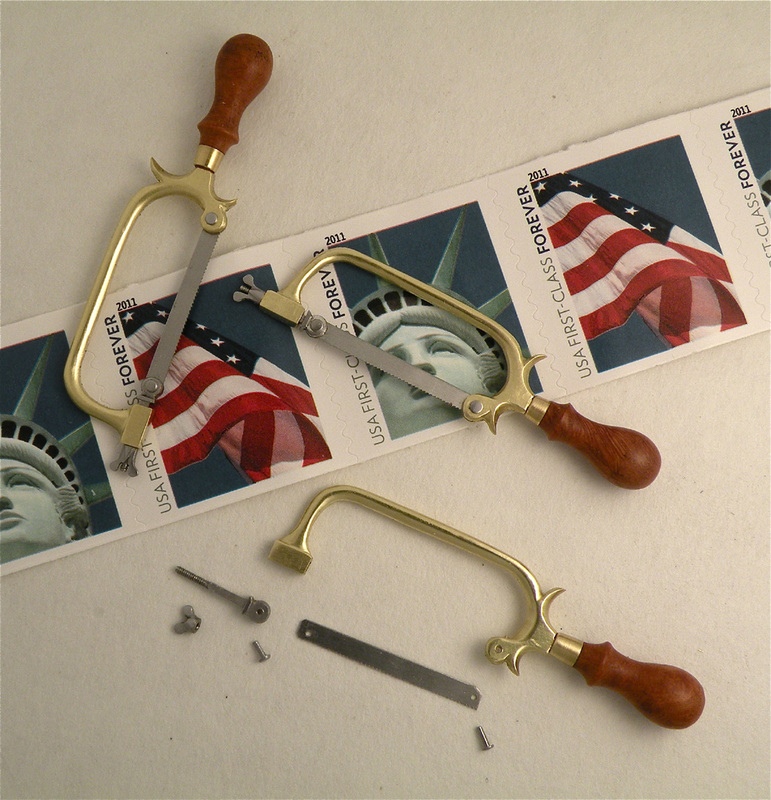 Just make it.” Whether a hinge, router bit, or part – if you don’t have it, just make it. In that one day I visited his workshop, he showed me all the basics to those things. I was so lucky, because the experience was truly inspirational. 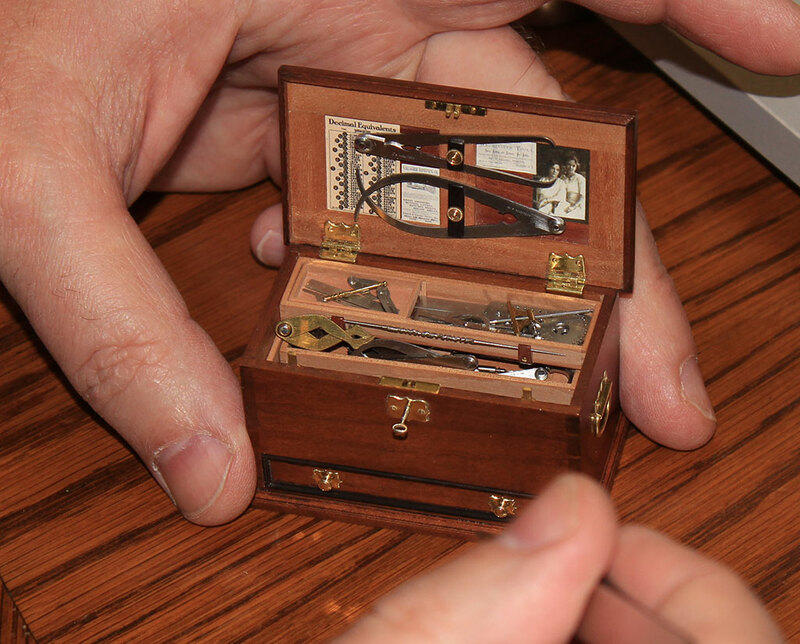 When I went to visit Paul, he was working on a little chest at that time, and created three miniature chests. Coincidentally and many years later, I came to own one of these chests that I had seen on his workbench that day I came to visit him. Do you collect miniatures yourself? I have a few, but very few. I learned that one of the funny things about hobbies and business is that once you go into business with your hobby, you’ve ultimately ruined your hobby. I make an effort not to collect miniatures, but I still collect tools. The tools I collect are getting harder and harder to find. Some of these include fine tools for doing fine work, rare tools from the 17th and 18th centuries, and tools that are signed by the craftsman. I love very old tools, made of silver or ivory. One of my favorite pieces is a square tool by Nicolas Bion, mathematical instrument engineer to King Louis XIV of France. Upcoming shows and projects in the works? I’ll be teaching at the International Guild of Miniature Artisans’ Guild School in Castine, Maine next month (June 2015). It’s my 30th year teaching there, and the 12 students in my class have been coming back for a total of 192 years. The IGMA Guild School is unique because for an entire week, attendees don’t have to explain “why miniatures?” to anyone. After that, I’m heading to Copenhagen, Denmark and to Paris, France to teach. I’ll also be showing work at the Grunwald Gallery at Indiana University from August 28 through October 3 as part of The Miniature exhibition. And, I have a few works on display at The Online Miniature Engineering Craftsmanship Museum (also known as the Internet Craftsmanship Museum). I was recently recognized as the 2015 Metalworking Craftsman of the Year. My advice to any young artist: be the best you can be at what you do, and there will hopefully be someone that will like your work enough to support you. Have high standards about your work, and you’ll always have to do better the next time around. That’s worked very well for me. And I’m just starting to get the hang of it all after 38 years. Anything else you would like to add? What do you want miniature enthusiasts to know about you? 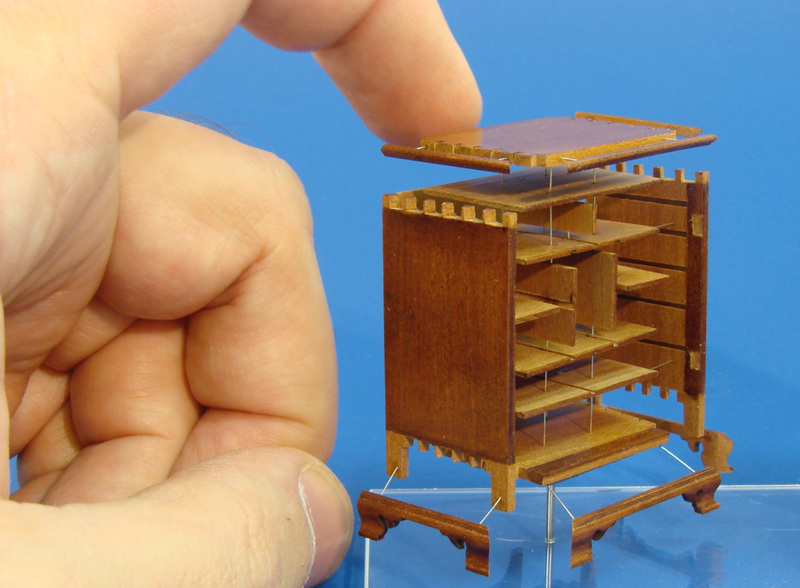 One of the coolest things about miniatures is that you can spend $5 on a miniature table or you can spend upwards of $50,000 on a miniature table. There are not a lot of hobbies where that applies, so I find it fascinating. Everyone can play and enjoy them, no matter your personal aesthetic or style. My current slogan is, “Details matter.” Because, that’s what it’s all about. A guiding principle in business is that you make each thing better than what you did before. Never go backwards, always go forwards. William “Bill” Robertson hails from Kansas City, Missouri. 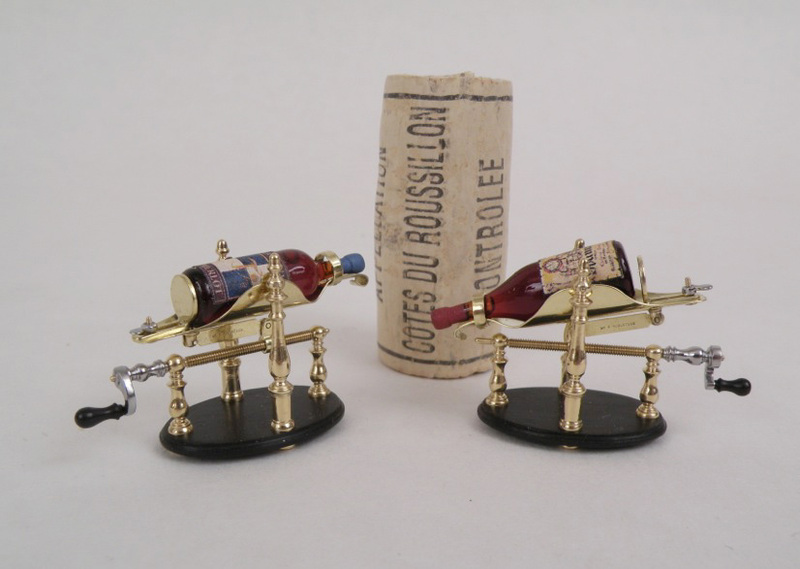 He was recognized with Artisan status in metalwork by the International Guild of Miniature Artisans and in 2011, received the Don Buttfield Award for his exceptional contributions to the field of miniatures.